The College of Science Alumni Board is seeking new members for a three-year term. Potential board members should be a graduate of one of the College of Science departments and a member of the Purdue Alumni Association. The Science Alumni Board meets twice a year, on the Fridays of homecoming weekend and Spring Fest weekend. Board members help to improve alumni communication efforts, support the College of Science advancement efforts by promoting Purdue Day of Giving via social media, help to plan an annual summer alumni event, develop mentoring relationships with current Science students, and promote membership in the Purdue Alumni Association. If you are interested in joining the Science Alumni Board, please contact ScienceAO@prf.org. 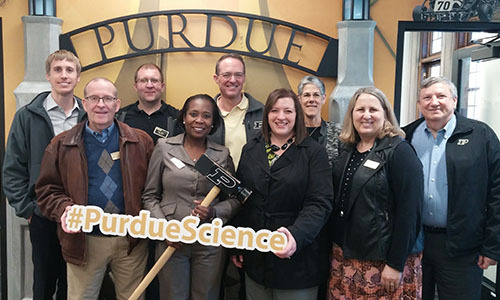 Create a sense of pride in the College of Science, Purdue University and the Purdue Alumni Association. If you are interested in joining the Science Alumni Board, please let us know as we are always on the lookout for new members! Email ScienceAO@prf.org for more information!